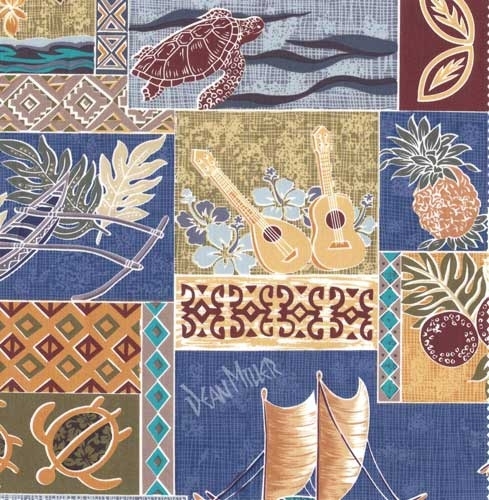 This Beach Themed Shower Curtain is 72" x 72"
DM418 - Sunset Beach Shower Curtain features a patchwork type fabric, with Hawaiian beach themes. Lots of colors to work with. Perfect for any beach house, or if you are looking to re-do your urban city loft to have a beach themed bathroom. 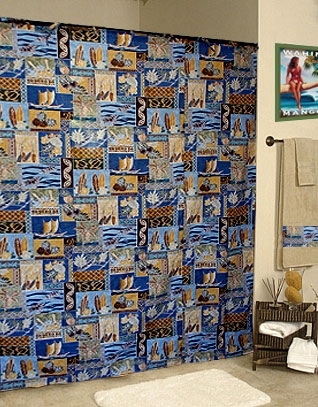 Beach themed shower curtains measure 72" x 72"
Beach Designer Tip: Add one of our tropical shower curtain hooks for the ultimate beach bathroom! 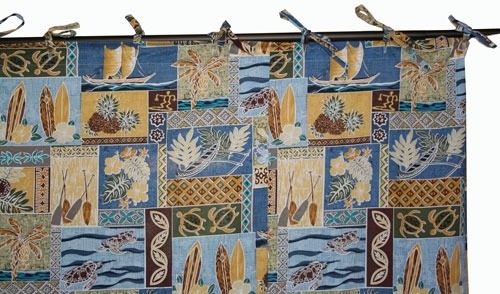 We have coordinating tropical shower curtain hooks available here at our online store if you want a fun Hawaiian beach theme for your bathroom. Only $39.99 each for this beach themed shower curtain. Bring home some aloha with a Hawaiian shower curtain! Click on the photo above for a larger view or scroll your mouse over the beach themed shower curtain picture for detailed product shots. 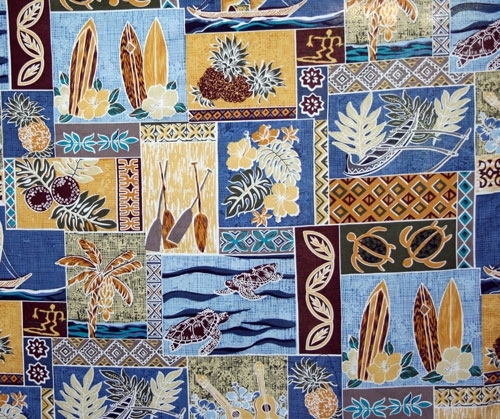 If you have any questions or concerns about Hawaiian decor, or want to order over the phone, please remember you can always call us at (949) 370 - 6535 or chat online with one of our beach re-decorating experts! Excellent item. Beautiful print and colors. I liked the one in my guest bathroom so much that I bought a matching one for my master bathroom. Best bedding company on line! I ordered this shower curtain for my boys' bathroom. It arrived quickly and looks perfect with the tile and wall color. The quality is excellent--thank you!